Disclaimer – Any kind of data collected by these kind of sensors should never be used for diagnostic purpose. It is advised to measure your blood pressure, via certified dedicated medical instruments. Samsung has been highly concerned to add health related hardware and software in their Smartphones, particularly in their flagship devices. Their “Samsung Health” app still tops other phones' native apps offering SpO2 reader (blood oxygen checker), heart-rate reader, stress level and yes, a better pedometer app that measures your workout pretty well. But they didn’t stop here. 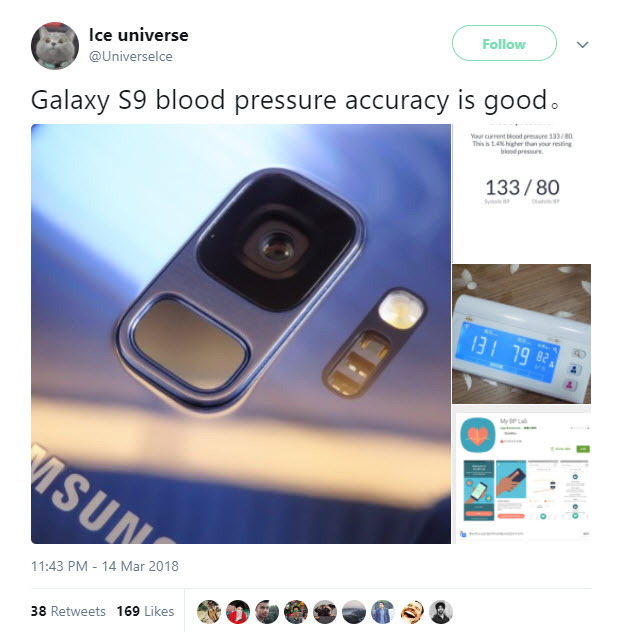 Samsung stuns the mobile industry by implementing blood pressure reader in its recently released flagship phone S9 (S9+). Software development for this new technology is still in beta and currently you can test this feature via a Google Play app that is exclusively available for aforementioned devices in US region. This is a less known feature of S9 as Samsung is not marketing it on S9 sale page. However, official information is available on Samsung press release page. At Samsung, we have a firm commitment to the health and well-being of our users,” said Peter Koo, Senior VP and leader of the Health Service Team at Samsung Electronics. “That’s why we developed a revolutionary optical sensor in the Galaxy S9 and S9+. We are pleased to be partnering with UCSF to utilize this sensor and contribute to research that will provide our users with crucial and meaningful feedback about their health. Being collaborated with UCSF, Samsung has created a Digital health app dubbed as “My BP Lab”, which will permit the user to monitor their health by measuring the Blood flow inside the arteries and vein of their body by just using this app. The app will check out your blood pressure using the latest optical heart rate sensor of the Galaxy S9 and S9+ and by that you will be able to know how your heart reacts under various circumstances (by looking at readings of systolic and diastolic pressure). The BP Lab app has become available on Play Store since March 15, 2018. After downloading the app users will be requested to connect with a USCF study to track their sentiments and stress, also to know how much these affect their health. After a certain period of time participants will also have to delineate regarding their behaviour e.g. their exercising, sleeping and eating patterns. Since it is a research based initiative, after getting the information from users the researchers will match the details with B.P. readings and then give feedback on participant’s stress level. Okay, over that all you have to do is to download the app from the Google Play store for no cost. The app can also generate customized perceptions for people in order to boost their overall well-being. Peter Koo, senior VP and leader of the Health Service Team at Samsung Electronics, stated that at Samsung they had a firm commitment to the health and well-being of their users and that is why they developed a revolutionary optical sensor in the Galaxy S9 and S9+ smartphones. He further added that they are pleased to be partnering with UCSF to utilize this sensor and contribute to research that would provide their users with crucial and meaningful feedback about their health. That’s not all; Samsung is also planning to restructure the Bixby app for the newly launched Galaxy S9 and S9+ smartphones. The motive behind this is to make users capable to check out how much calories they eat in their overall foodstuffs, and it will happen by simply looking through the camera of the handset. This feature will definitely prove helpful for calorie conscious people.